I’ll be in the Gallery again today, trying to contain the excitement I’m feeling from being able to engage with actual letters from Charles Dickens to Patrick Allan-Fraser. 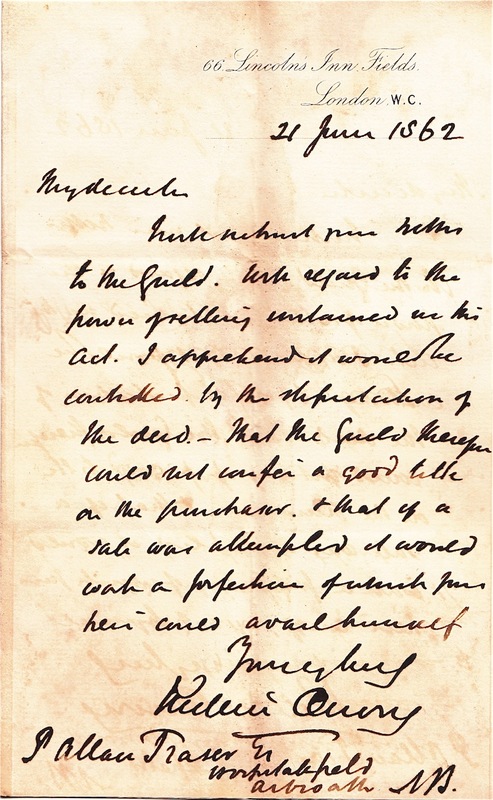 The first letter that Dickens - then the most famous author in the world - wrote to PAF was dated Monday, 19th April, 1858. So it would have been received here on the Tuesday or Wednesday. 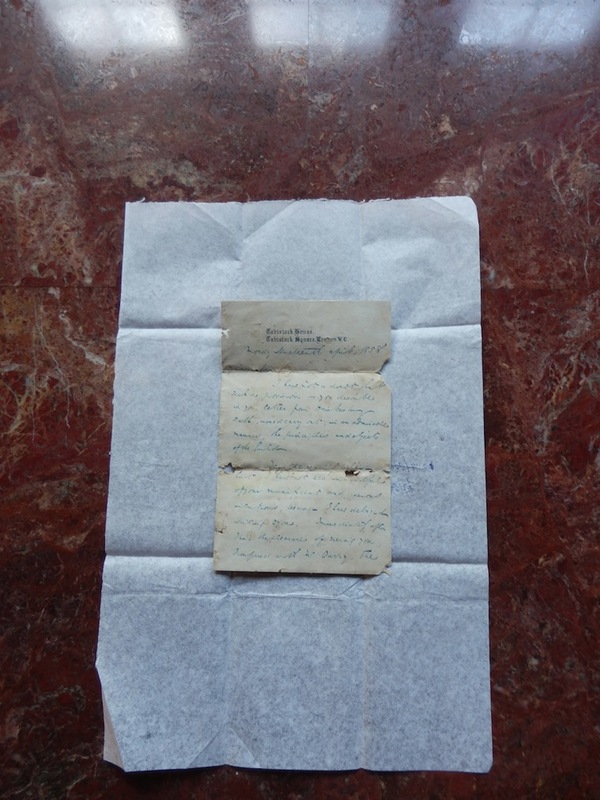 I don’t know where Patrick opened his letters, but I’m opening the tissue containing the carefully preserved envelope and letter on the marble desk at the decently lit end of the Gallery. Well, I say marble, but according to George Hay’s Hospitalfield, the table-top was cut from a great jasper boulder found on the foreshore at Hospitalfield in the days, pre-railway, when its lands extended all the way to the sea. Dickens has written ‘Allan Fraser Esquire, Hospitalfield, Arbroath’ on the front of the envelope. 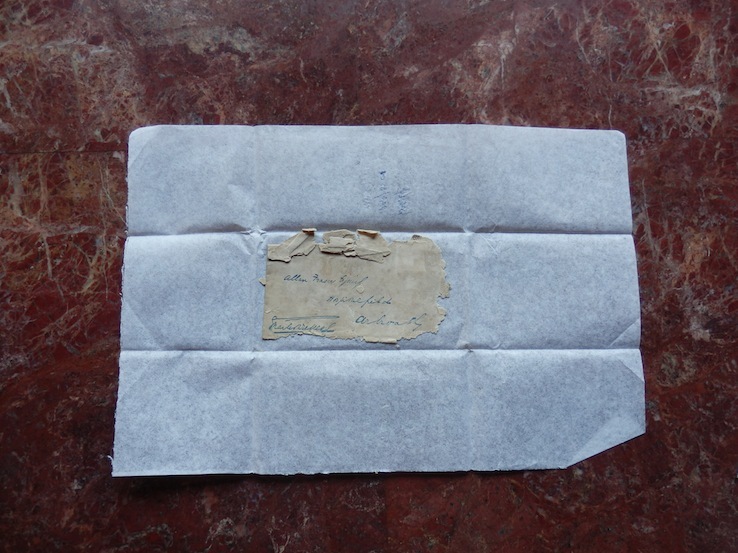 He has also written his own name in the bottom left corner of the envelope, while top right you can just make out a very faded Penny Red. The second letter from Dickens, written on the third of May, is just to confirm that the Guild’s solicitor has had confirmation that Parliament will indeed have to ratify the change to the constitution. The paper that this letter was written on has yellowed and marbled over time. 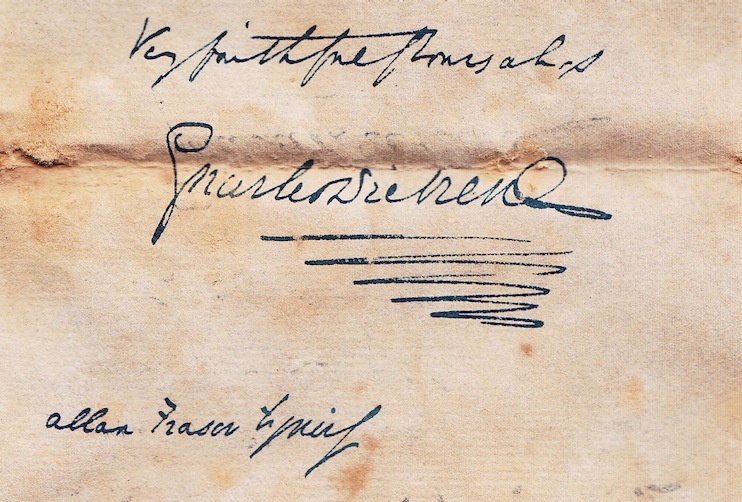 Here is the letter’s signature, written close to the top of the third page, the second having been left blank, the words preceding it being: ‘I am always my dear sir, most faithfully yours’. Funny old signature, I can’t help thinking. Very much the same as the first one, all the emphasis in that final curve - in the ’s’ of Dickens - followed by the seven loops of a zig-zagging underline. Only five squig-squags (flip-flops? scrib-scrabs?) under the signature this time. Does that mean anything? A handwriting expert might have a view. In the meantime, let me push on with my Great Expectations. NIce to have such a gung-ho sentence written to you by the one and only Charles D, mentioning both yourself and your loved one. Wonderful, in fact. ‘Dear Ouvry, I have considered and re-considered the points we talked of yesterday, and have gone over them again with Foster. We must positively come off for a payment of Six Hundred a year, including everything. This will keep her Brougham quite as well she has ever had it kept, and will do all she wants, I am sure. So what was going on? Well, in 1857 Charles Dickens, aged 45, had met and fallen in love with Ellen Ternan, an actress who was 27 years younger than he was. As well as her youth, Ellen had energy and intellect, which, according to Dickens, Catherine didn’t have. (Mind you, twenty-years of incessant pregnancy and child-rearing would blunt, or rather re-route, the mental development of anyone.) Matters came to a head in 1858 when Catherine Dickens opened a packet delivered by a London jeweller which contained a gold bracelet meant for Ternan with a note written by her husband. The Dickenses separated in May, 1858, after 22 years of marriage. 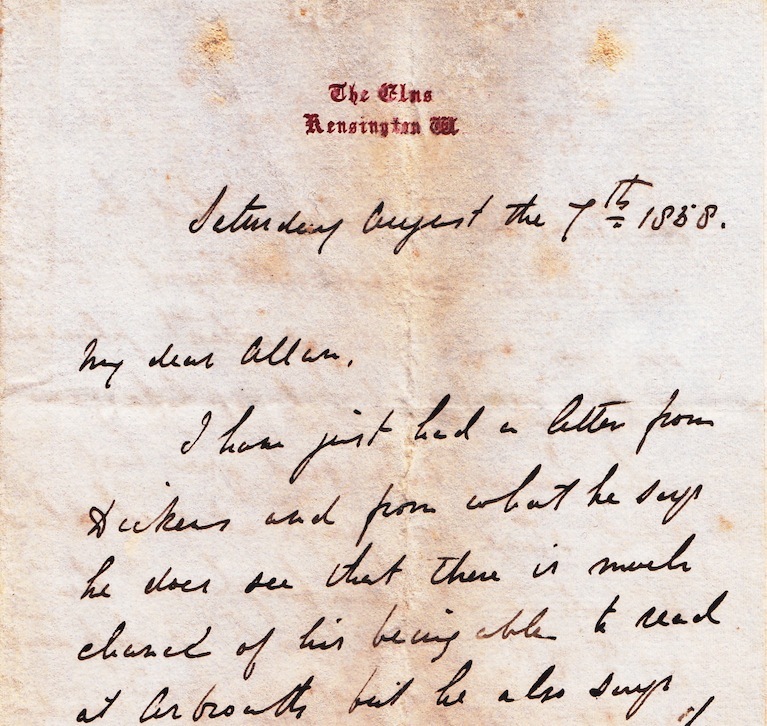 Let me commemorate that moment of change with a photograph in the Gallery involving one of the letters that Dickens sent to Patrick in that same month of May, 1858. I don’t suppose Catherine Dickens has as much respect for the words of Charles Dickens as some people do. By 1858 I think she’d probably have been quite happy to trample his self-serving letters into the ground or drop them into her bath water, whichever seemed more practical at the time. I however, have a great deal of respect for the heritage value of these words and it is with great care that I dust a surface of marble, lift the letter and place it as I do. What may seem casual to the eye is nothing of the kind. This is bringing to mind some work that Cornelia Parker did with a Charles Dickens motif. If I remember rightly, she used a white silk handkerchief to remove tarnish from a knife used by the Dickens family and then displayed the handkerchief. And when she made an exhibition, whose centrepiece was Tilda Swinton lying in a glass vitrine in the Serpentine, elsewhere in the room, in smaller vitrines, were placed objects relating to high-achieving males. For instance, the goose quill of Charles Dickens. 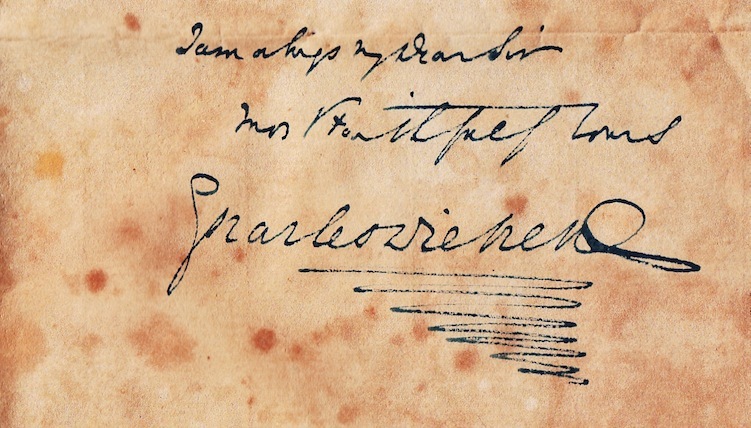 Perhaps the very quill he used to write letters to his lover. The white marble statue in the Gallery, Clytie with a sunflower, by William Henry Rinehart, makes as good an Ellen Ternan as it does a Catherine Dickens. So how about the image below, with Ellen Ternan, or Nelly as she was known, holding a letter from Dickens in her hand? (It just happens to be a letter that CD sent to PAF that she’s got hold of. But she needn’t worry, she won’t have to wait long for letters of her own. Letters full of admiration, kisses, promises, presents and promises of presents.) Again I take great care. The letter fits beautifully into Clytie's hand and is held there in absolute safety. Careful Nelly, do not grip the paper tightly as moisture will flow from your lily-white hand to the paper. You are but flesh and blood after all. If CD pricks your index finger, does it not bleed? I hasten to repeat that I’m actually handling these valuable letters minimally, having carefully photographed them in order to be able to read them at my leisure (and to make the words available to others once that’s been discussed in-house), then placing them gently back in their tissue guards. Once again, no strain was placed upon the fabric of this letter in placing it so. No risk was taken that the precious sheets of paper that came all the way from Tavistock House would become dislodged from their marble resting place. Perhaps my motivation for photographing the letters in this context is to emphasise that they are part of the fabric of Hospitalfield House and collection. The exquisitely written delicacies add to the weight - and lightness! - of the history that’s to be found within these walls. No way should these letters ever be cashed. They are worth 100 times their monetary value to Hospitalfield in their present form. Dickens sent the letters to Patrick here, and here they must surely stay. I’m hoping this text will somehow help with that. Presumably PAF attended one of the talks and met Dickens again, but I don’t know. 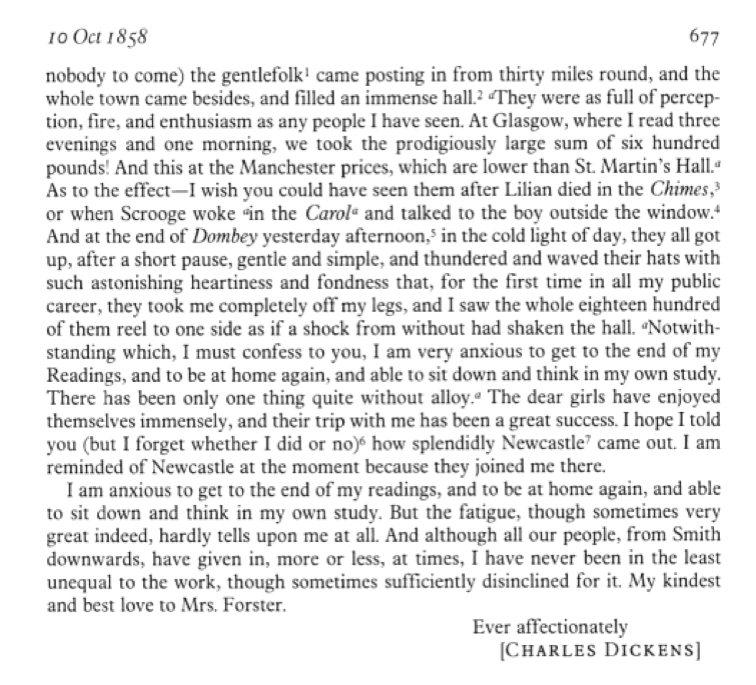 Dickens had this to say about his appearances during the tour, though I’ve also included this sample from the Pilgrim edition of the letters because of the editor’s mention of Dundee, marked in orange near the foot of the extract. Dickens’ had been reading in Scotland, the fourth of his four dates in Glasgow being the day before he wrote this letter. 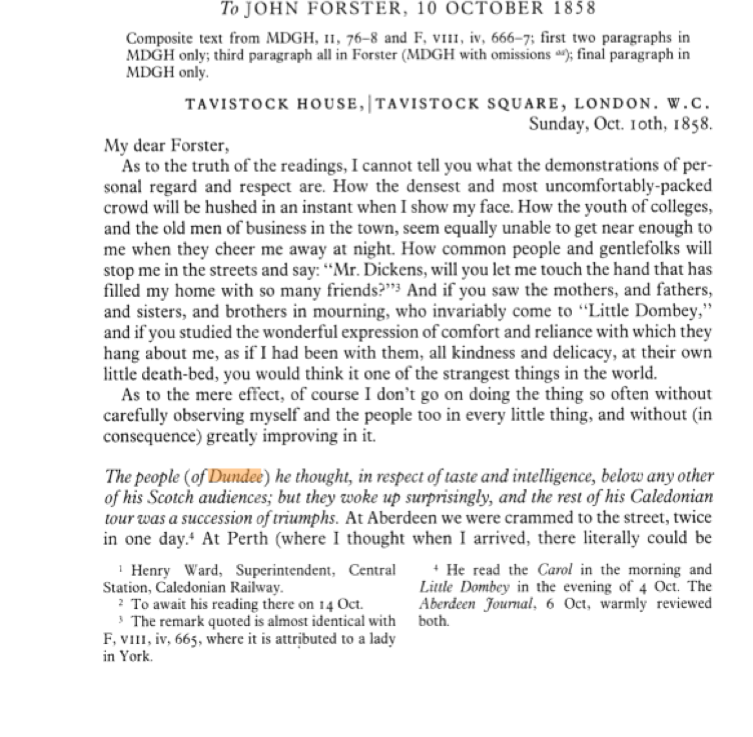 The Dickens’ letter to John Forster goes on as follows. The ‘girls’ he mentions near the end are his own daughters. That’s it for 1858. Dickens is exhausted. Patrick is exhausted (presuming he was one of the crowd at Dundee or Edinburgh or Glasgow). I am exhausted. No that’s not right. 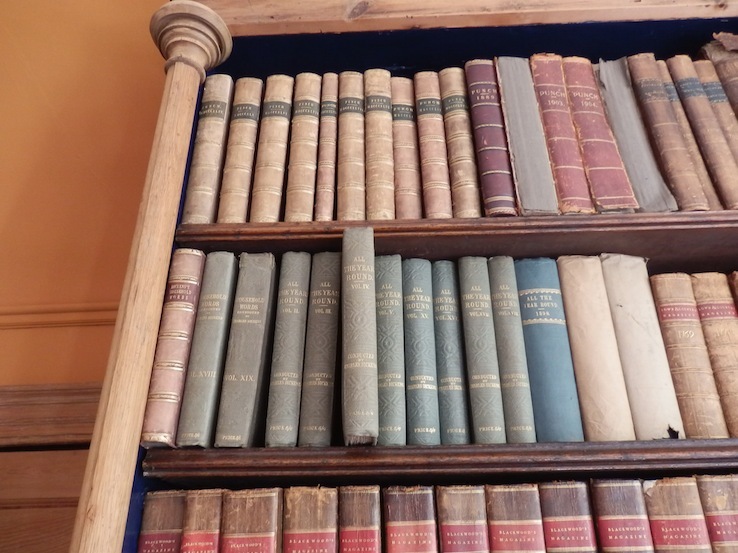 It’s still morning; I’m fresh and I need to bash on with this following the lost days when I was ill.
From 1858 until 1862, things stood still as far as Hawkesbury Hall was concerned. That is, the property of Patrick and Elizabeth was to be made over to Dickens’ Guild. 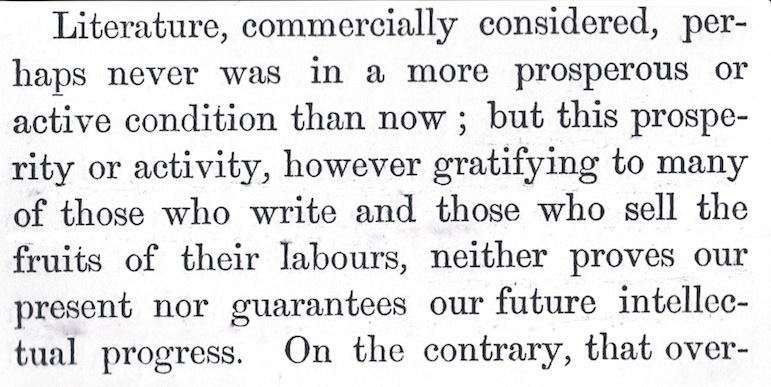 I suspect that all that was going on in Dickens’ mind in May 1858 culminated in the plan for a book. 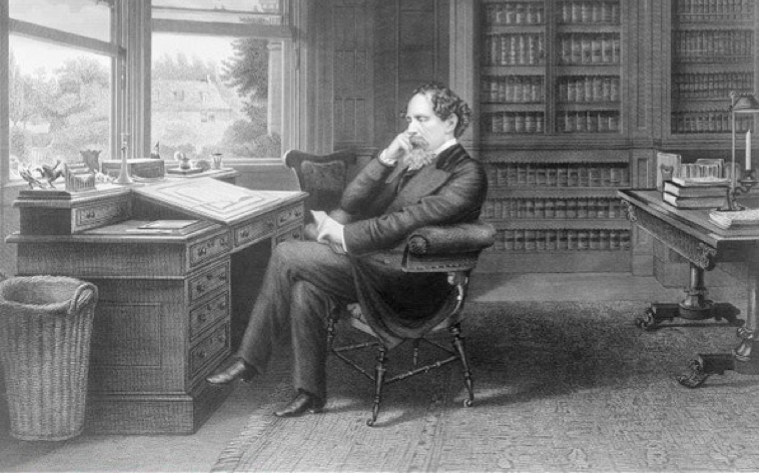 When the weekly journal ‘All the Year Round’ began to lose sales in 1860, when in the middle of a particularly dull serial by Charles Lever (A Long Day’s Ride was proving to be a very long and tiresome read) Dickens decided to introduce a new work by himself, something he’d already planned out, to be called Great Expectations. Pip (aka young Charles Dickens): Who learns that he has great expectations in that an unknown benefactor has bequeathed him a valuable estate. Miss Havisham (aka Catherine Dickens turned from overweight malcontent to skeletal superbitch): A woman now old, who has never forgotten her wedding day when she was jilted by her bethrothed. Estella (aka Ellen Ternan): The beautiful and aloof young woman who bewitches Pip. Magwitch (Patrick Allan-Fraser! ): Pip’s unknown benefactor. In fact, a convict who makes a fortune on the other side of the world. Yes, I’m hypothesising that Great Expectations was a way of Dickens weaving an imaginative tale around a structure given him by the deep feelings aroused by his relations with three people: his estranged wife, the lover who goes on to make his life a misery, and the man who has promised him Hawkesbury Hall! 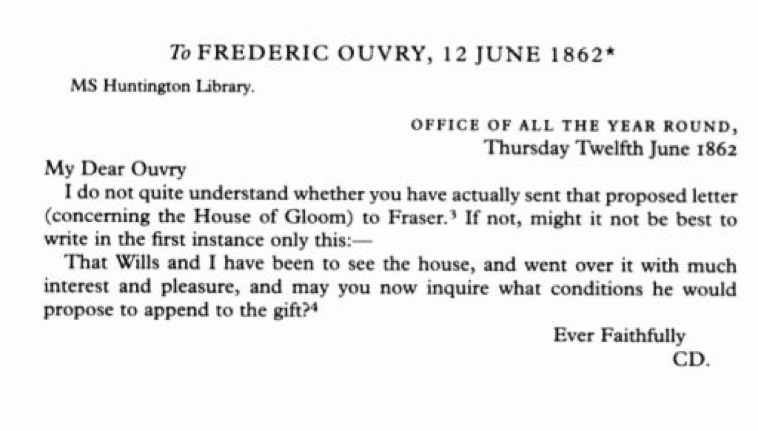 Not sure that anyone else has ever summarised Great Expectations like this, but then how many people know about the letters here at Hospitalfield? Also, I know through my research into the lives of Enid Blyton and Evelyn Waugh how the impact on an author’s writing of what happens in his or her life can be underestimated or even overlooked. Everything that Waugh wrote was inspired by things that happened to him. The happenings produced emotions in the writer - and the most effective way for him to get back to those emotions and explore them was to reinvent much the same happenings in ‘fiction’. On the opening page we are introduced to the escaped convict who accosts Pip in a graveyard. He will end up being Pip’s mysterious benefactor, but at this stage there would be nothing to dampen Patrick’s thrill of the evocative meeting of innocent child and desperate adult. The library here at Hospitalfield boasts a turret at one side of it, accessed by a door. 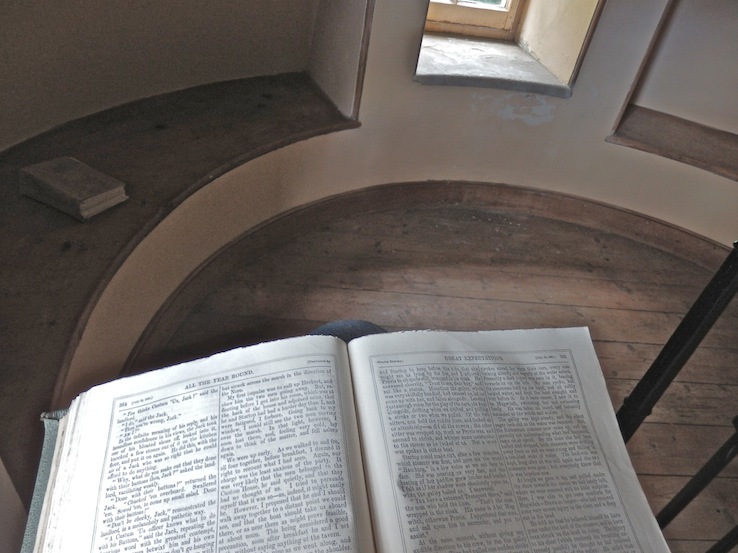 I envisage Patrick taking his copy of All the Year Round up to the top of this turret where there is a circular landing, with space to sit in the window recesses which let in excellent light to read by. A handsome property! There is plenty more to be made of this material. Indeed I feel I’m in the middle of telling an enthralling story. I think it’s appropriate though that I do it in instalments. 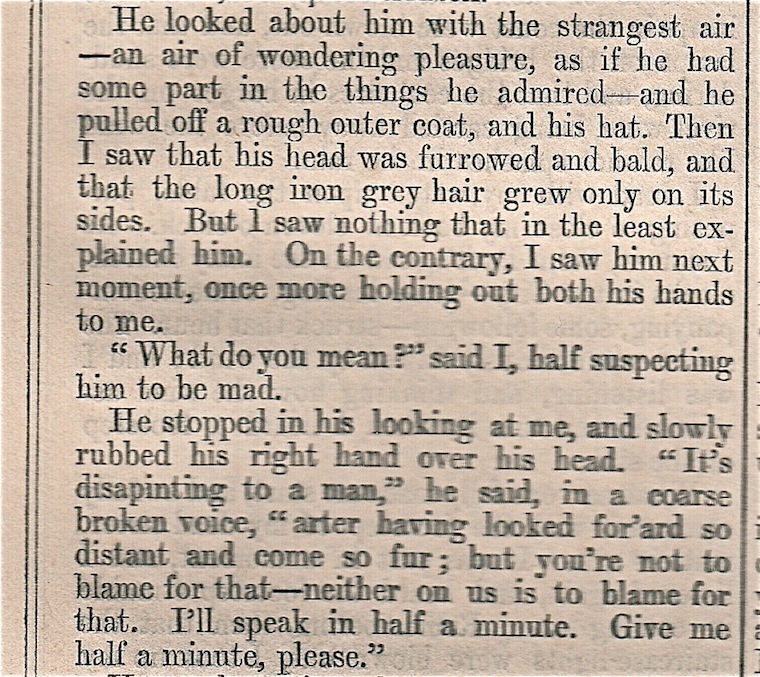 Bear with me, gentle reader, until I get a chance to post the next instalment of my own Great Expectations. Wednesday, 26 June, 2013. Two of my fellow artists-in-residence gave presentations of their work last night. Very interesting, but the words ‘Great Expectations’ did not even pass their lips. I guess it must be up to me to follow through on this. I’ve been told that the main tower at Hospitalfield would have been completed by this time and that Patrick had a writing room in it. I’ve also been told that his writing room was the room beneath the one holding the telescope. But I can’t believe that, as the room is dark and small (and at present used for storing paintings). So I’ve got Patrick sharing space with his telescope, pointing his telescope at Arbroath, all the better for him to make his free enquiry into existing sources of demoralisation and to work out what has rendered inefficacious the schemes of reformers lay and clerical. That’s the foot of page 304. My copy of this book, a great mouldering lump of pages that are on the one hand uncut (nobody has read this copy) and, on the other, detached from their bindings (nobody else ever will read this book) was given to me by Willie Payne a few years ago, plucking the book from a cupboard full of them. I did cut a few of the pages in order to gain access to the words which I made a little progress with. This is reminding me that novel-reading was one of the first mass popular entertainments, long before cinema, TV and the internet. Not that PAF’s book was a popular. But Scott’s oeuvre was and so was that of Dickens. 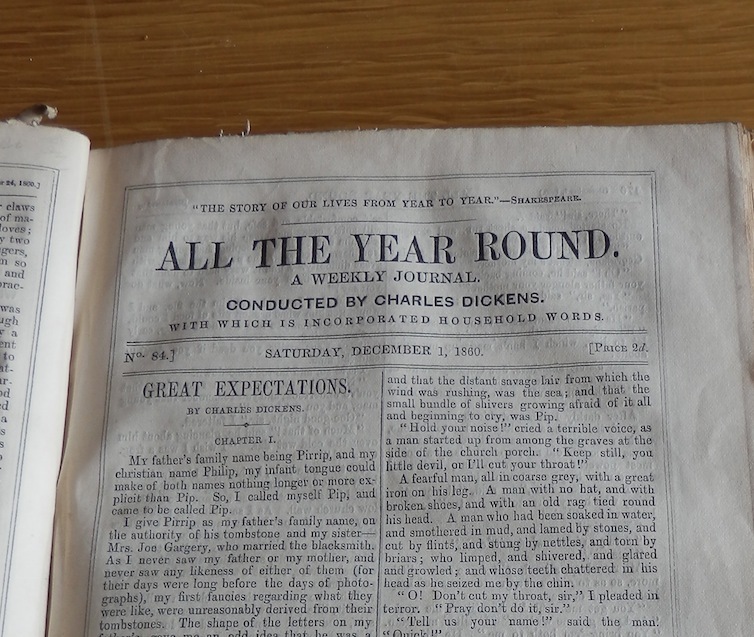 The circulation of ‘All the Year Round’, when Great Expectations was driving up readership, could be as high as 300,000. That was higher than the daily sales of the London Times. I told myself I’d stop at the first mention of God, so that’s what I’ll do. Though when I take a proper look at Pat’s book on another page of this website it’s the religious dimension that I’m going to have to tackle head on. 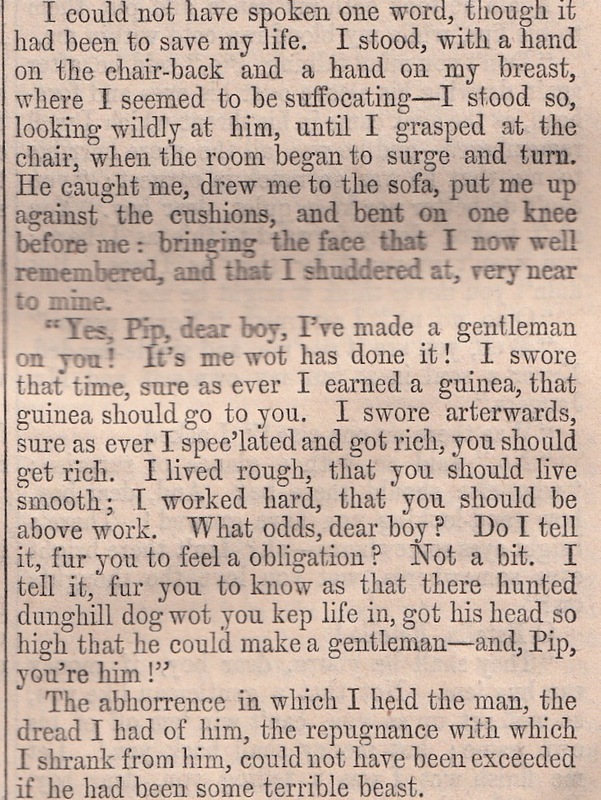 On the strength of his great expectations, Pip has been living the life of a gentleman in London. On attaining the age of 21 he began to receive £500 a year from his mysterious benefactor (who for a long time Pip thought was Miss Havisham). He’s rejected his good, simple friends from back home and he’s living a life of sophistry and selfishness in London. Well, no, he has managed to rise above self-interest now and again, but in general he’s come to feel rather ashamed of himself. By the end of the thrilling instalment, Pip has to get his head around the fact that his way of life is financed by this man who has worked long and hard over the years as a sheep farmer in Australia. Pip’s fine clothes were bought through the sweat of this man’s brow. It’s tough for Pip to take. Disgust and shame are the two feelings that threaten to engulf him. Now that episode went out into the world on May 11, 1861. It was just a month later that Patrick was distributing copies of An Unpopular View of Our Times. We know this because of the letters of acknowledgement that came from his old chums of the Clique. 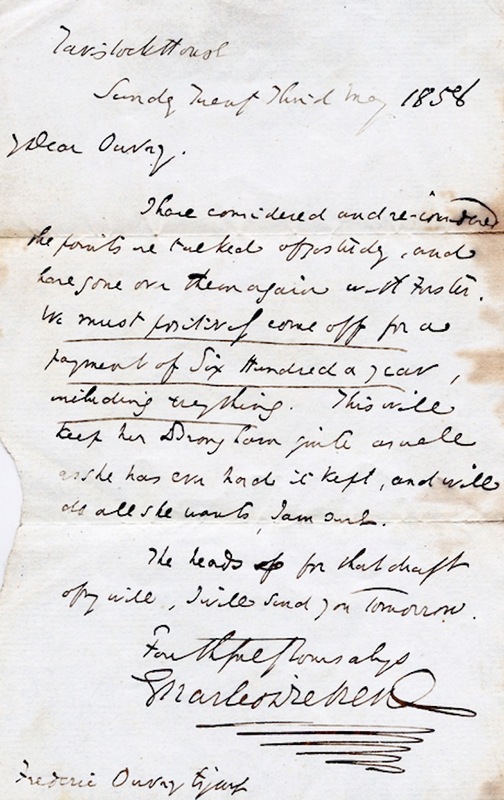 WP Frith, Augustus Egg, EM Ward and Henry O’Neill all wrote to him at Hospitalfield between June 24 and July 4, 1861. What about Charles Dickens? I feel sure that Patrick would not have been able to resist sending him a copy of his magnum opus. 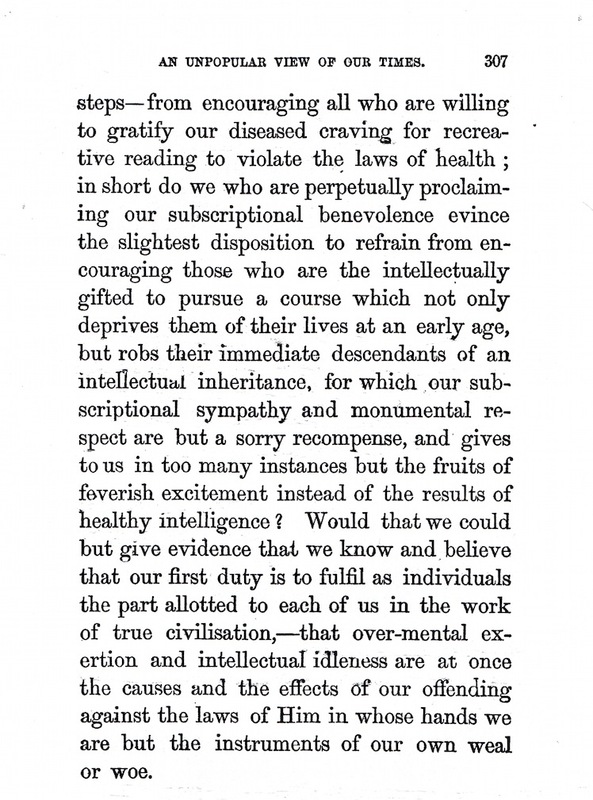 (‘My dear Sir, Please find enclosed An Unpopular View of our Times, a humble complement to your own Hard Times’). And really Dickens should have taken a minute to acknowledge the book’s existence, if nothing else. I can’t help feeling this would have helped the chances of the gift of Hawkesbury Hall going ahead. 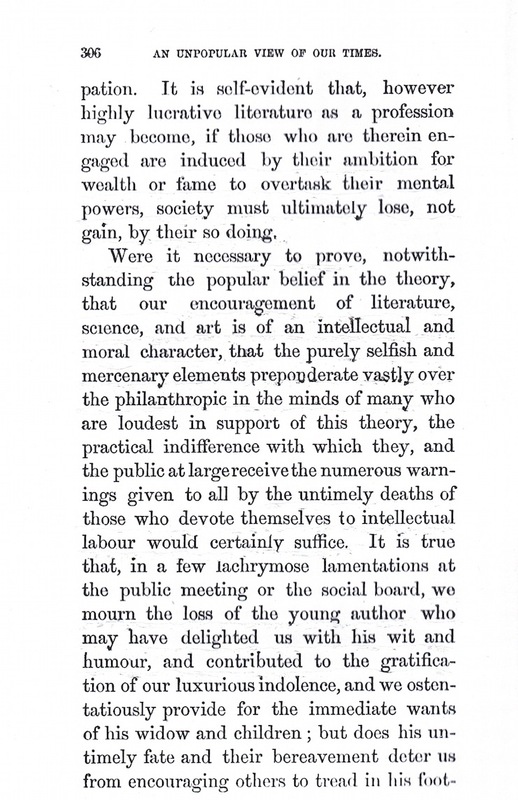 But perhaps Charles Dickens was in a different head space by the summer of 1861. After all, Magwitch, Pip’s mysterious benefactor, had been transported to Australia for life at the beginning of Great Expectations, and in coming back to see Pip, to see what a gentleman his money had paid for, he was placing his fortune at risk. If he was caught by the authorities, he’d be convicted of a felony and his estate would go to the crown. Pip would have great expectations no more. In other words, Dickens had perhaps worked through his own great expectations: they were false expectations. A true gentleman was born as such or became one through the exercise of moral choice. Pip (Dickens) had made too may bad choices in life and would never be a true gentleman. But by making honest decisions from then on, by treating other human beings fairly and with empathy, that was how Pip (Dickens) could still make the most of himself and preserve some self-esteem. That was how he could contribute to the sum of human happiness. 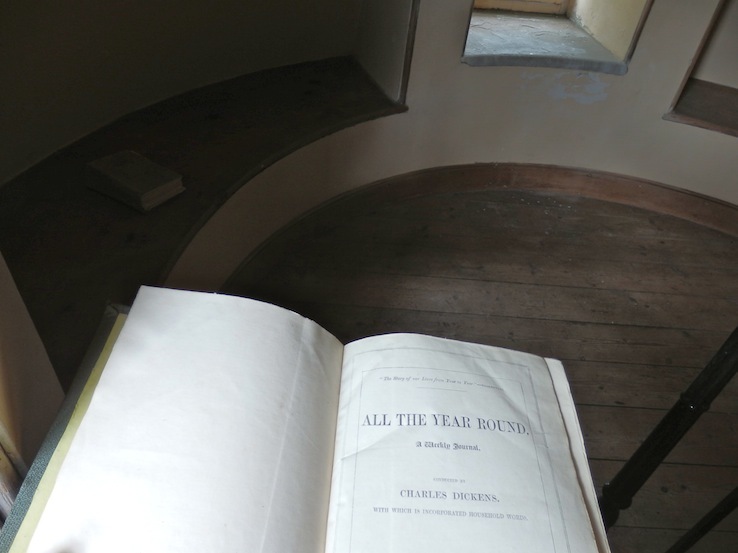 Great Expectations was nearly finished (the last episode appeared on August 3, 1861) when a copy of An Unpopular View of Our Times would have rolled up at Gads Hill in Kent, where Dickens then lived apart from Catherine but with many of their children. What did he do with the unsolicited book? I like to think that Dickens sat and envisaged how he might have written the May number if he’d had the oddity of a book to hand then, in particular the scene when Magwitch turns up at Pip’s abode. OK I need to come back to earth here. 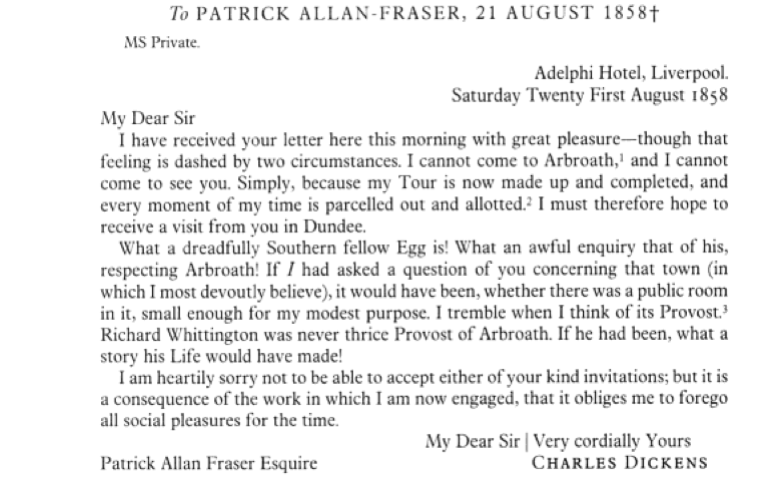 While it’s true that both the way Great Expectations turned out re the mysterious benefactor, and the lack of any acknowledgement of An Unpopular View from the master of Gads Hill, may have piqued Patrick Allan-Fraser, I’m sure it didn’t fundamentally change anything. In good faith, Patrick still had Hawkesbury Hall marked down as a gift for Dickens’ Guild of Literature and Arts. In any case, things moved swiftly to a head in 1862. Unfortunately, there are no images of the hall itself on Google. Perhaps much of it has been demolished. I’m not sure but will try and find out. Mr Dickens and Mr Wills have been to see your house and went over it with much interest and pleasure. May [illegible] on the part of the Guild ask what conditions you would propose to annex to the gift. Patrick would have been pleased that Dickens set foot on his property. Hospitalfield might have been a step too far for the busy Dickens of 1858, but, post-Great Expectations, he’d taken a stroll around the grounds of Hawkesbury Hall and obviously liked the feeling of fine English turf under his foot, albeit the atmosphere inside had brought to mind the phrase ‘House of Gloom’. 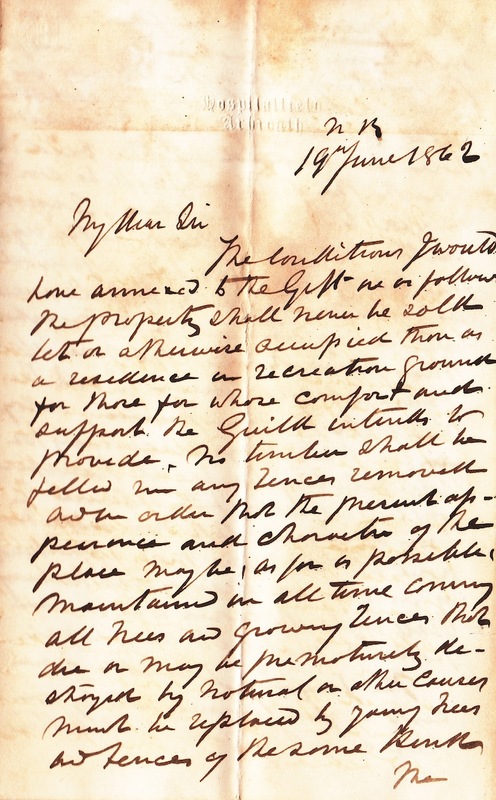 ‘The spirit of these conditions with some reservations required for the working out of the mines and for the convenience of my tenants of the fields adjoining I would have embedded in the deed by which the property will be conveyed to the Guild. I would further stipulate on another request that two years or as long a period as the arrangements of the Council and the requirements of the members may permit shall lapse before I give up possession. I ask this not with the view to delaying the proceedings necessary for completing the legal transfer of the property but because I am desirous that my wife may have at least one more opportunity of visiting or seeing Hawkesbury Hall before it ceases to be in our power to make it our home. I should just say here that Lytton Bulwer was a great friend of Dickens, and a fellow writer, whose own serial began in ‘All the Year Round’ when Great Expectations finished. 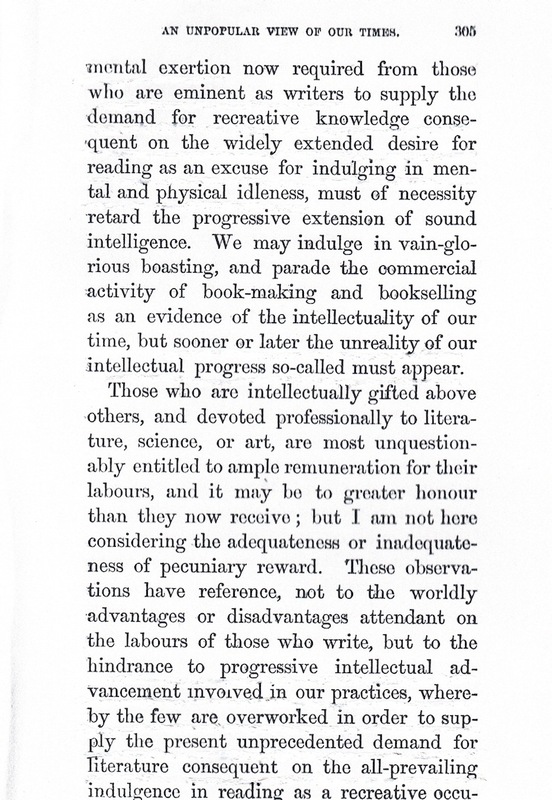 He also recommended that Dickens change the end of Great Expectations, a recommendation that Dickens took up. Instead of Pip’s final meeting with Estella being the meeting of two broken individuals who had gained humanity through their respective sufferings, and who then go their separate ways, it becomes the meeting of two broken people who have found sufficient humanity that they might live out the rest of their lives together. As with Charles Dickens and Ellen Ternan? 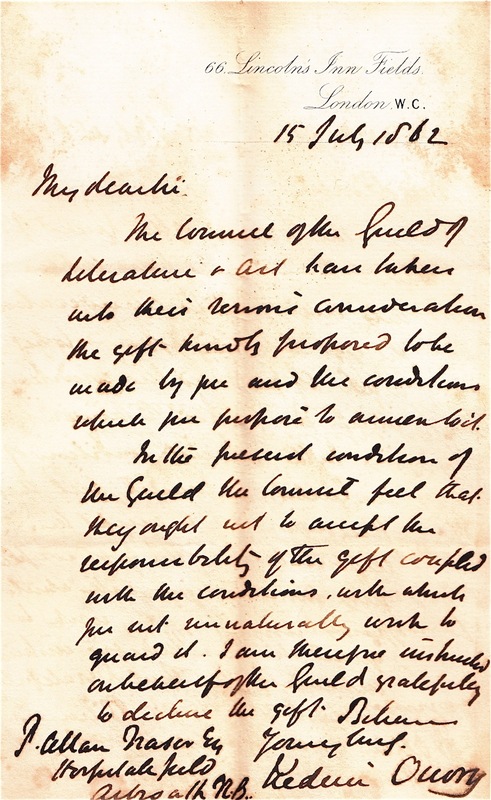 ‘You will see what I mean as the Act specifies the lands and residences over which the permit to sell grants demise and is not to extend [illegible] before the acceptance of my Gift by the present members of the Council can bind their successors and respect new conditions the property must be protected from the dealing and selling power contained [in the Act]. William Payne, director of Hospitalfield from about 1975 to 2012, has suggested that Patrick had got wind of the fact that Charles Dickens was likely to sell the whole place to raise funds to bale out other ‘interests’ of his, and refused to transfer titles until there was protection from this in the deeds. I will [report] your letter to the Guild. With regard to the power of selling contained in this Act. I apprehend it would be controlled by the stipulation of the deed. – That the Guild therefore could not confer a good title on the purchaser. And that if a sale was attempted it would work a forfeiture of which [no] heir could avail himself. The Council of the Guild of Literature and Art have taken into their consideration the gift kindly proposed to be made by you and the conditions which you propose to annex to it. In the present condition of the Guild the Council feel that they ought not to accept the responsibility of the gift coupled with the conditions, which you not unnnaturally wish to guard it. I am therefore instructed on behalf of the Guild gratefully to decline the gift. Do I hear sighing in the foreground? Never mind Patrick. You’ll get it right next time. When the time comes for you and Elizabeth to gift Hospitalfield to the artists and writers of tomorrow, you’ll have it all thought though. No need to pass it to them via the enormous ego and fragile finances of Mr Charles Dickens. Do I hear sobbing in the background? Come on, Pip, pick yourself up from the gravel drive of the House of Gloom, and dust yourself down, lad. After all, you’ve got someone to hold hands with from now on in. No-one could ask for more. Is that about it for this page? 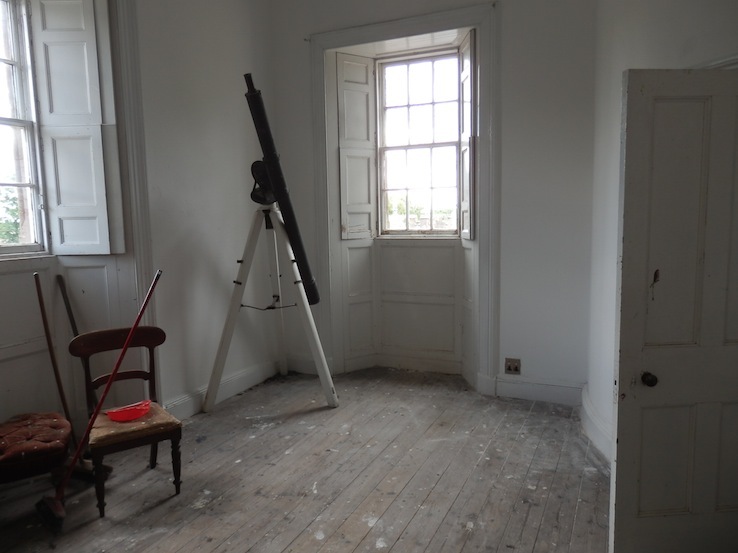 William Payne points out that the room in the tower that Patrick had fitted out as a writing room was two floors below the top room (the one with the telescope) in the tower. Willie reminds me that in Patrick’s time the library was not where it is now, but was only moved there in the late 1970s. So perhaps Pat is less likely to have read ‘All the Year Round’ in the room at the top of the turret as I’ve suggested. That particular copy of ‘All the Year Round’ does have PAF’s initials at the foot of the title page all right, so we can be pretty sure he read it somewhere in the building. 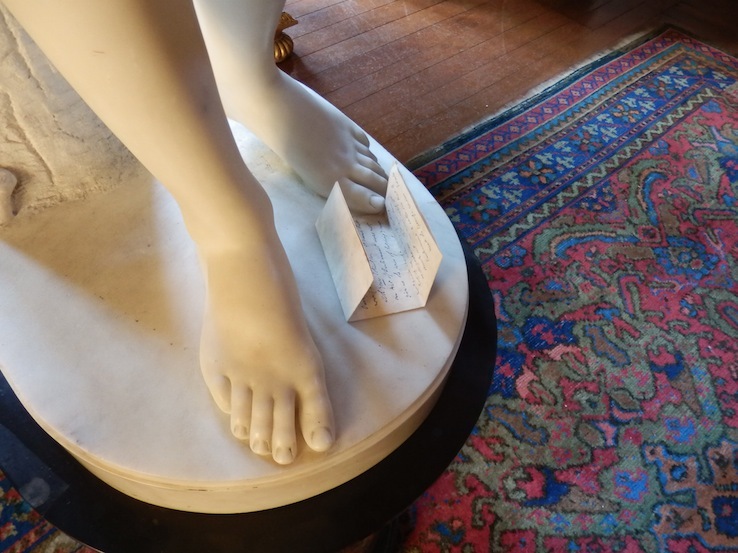 Lucy Byatt intends to archive the letters at Hospitalfield, including those from Charles Dickens, in a way that is state of the art in terms of allowing public access while at the same time preserving the letters for visitors of the future.